Bitcoin Press Release: QashBack, a Singapore technology firm, is looking to transform the retail and services industries by developing an incentivised reputation management platform that connects consumers, merchants and advertisers for transparent interactions and ease of mind on data privacy issues. 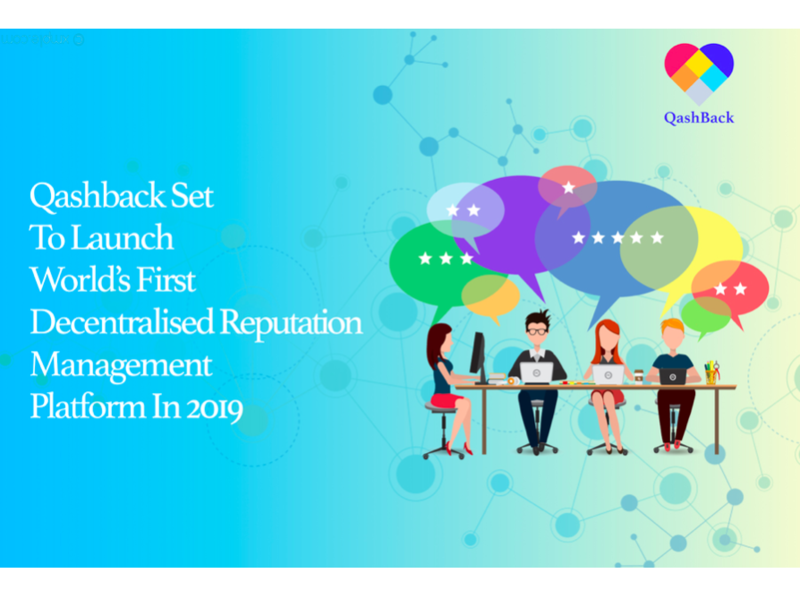 5th of January, 2019, Singapore – With plans to release in Q2 2019, the QashBack platform is set to revolutionise the online reviews market as it leverages on the characteristics of blockchain technology. Users on the QashBack platform are rewarded with QBK tokens, the ecosystem’s own cryptographic token, for writing reviews, regardless of their bias. This change alone significantly reduces polarisation bias that is inherent in existing online review sites. With permission from the consumer, merchants can offer QBKs as an incentive to encourage customers to participate in contests, view advertisements or take up a marketing promotion. Blockchain technology enables QashBack to acquire real and factual reviews for consumers through its immutability and authenticity. All transactions on the QashBack platform are recorded on the Ethereum blockchain, making them transparent, self-executing, not reliant on any single third party for clearing and cannot be removed or edited. QashBack has identified several target markets including Wellness/Beauty, Healthcare, Transit, Shopping, Food & Beverage, Travel, Entertainment and Education within the Southeast Asian region. Earlier this year, the tech startup signed an exclusive partnership with Oriental Mace Group Berhad to tap on its mobile application, MyBeauty, supported by the Malaysian government as part of their national tourism strategy. The portal encompasses over 1,000 beauty service providers and thousands of product suppliers to the beauty tourism industry in Malaysia. QashBack’s partnership with Oriental Mace will generate a critical mass of users and reviews, as well as grow Malaysia’s beauty tourism industry. The estimated receipts of US$18 billion per year will generate sustainable and rapid demand for QBK tokens. Qashback will mint one billion QBK tokens, of which 10% (one hundred million tokens) was made available for public sale on 10th of December 2018. With an opening value of US$0.40 per token, Qashback estimates gross proceeds from the public Token Generation Event will amount to US$36 million. Over US$14 million had been raised during the private sales launched in July, with contributors consisting of high net-worth individuals and institutional backers. Contributors who are looking to trade QBK on various crypto exchanges will get the opportunity to do so from 5th of January 2019 as the QBK token will be listed on UDAX Hong Kong that day. The technology firm also has plans to list in other top exchanges such as Coinsuper, Dobi Trade, Upbit, and LAToken during Q2 and Q3 2019. QashBack is the source of this content. Virtual currency is not legal tender, is not backed by the government, and accounts and value balances are not subject to consumer protections. Cryptocurrencies and tokens are extremely volatile. There is no guarantee of a stable value, or of any value at all. Token sales are only suitable for individuals with a high-risk tolerance. Only participate in a token event with what you can afford to lose. This press release is for informational purposes only. The information does not constitute investment advice or an offer to invest. The post QashBack to Launch Southeast Asia’s First Blockchain-Powered Reputation Management & Permission-Based Marketing Platform in 2019 appeared first on Bitcoin PR Buzz.